I love this tarot set. Okay, it's fluffy - but really, what else would you expect from deck about animals? 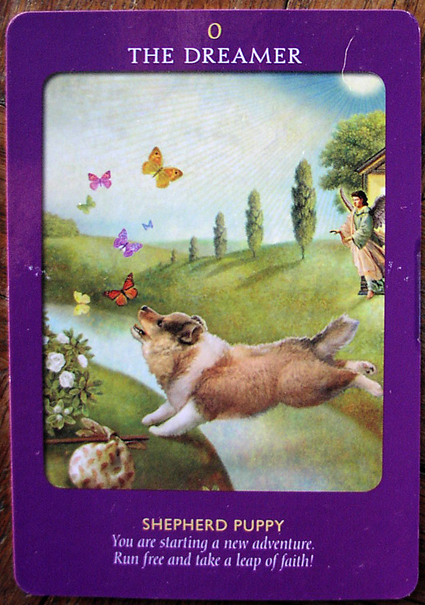 The Animal Tarot is the latest deck by Doreen Virtue and Radleigh Valentine and I was very curious to see it. After all, earlier this year Doreen publicly stated she was giving up creating tarot decks due to a change in her spiritual beliefs. So, I'm guessing this one might be her last set. I've reviewed several of her earlier decks on A Bad Witch's Blog, including the Fairy Tarot, the Angel Tarot and the Guardian Angel Tarot. I like all them and think they are ideal when you want a gentle reading. However, the Animal Tarot is my favourite. I love the way that animals have been used for their symbolism and the artwork is delightful. There's cuteness, humour, awe and wonder in the cards. They are lovely to look at and I've found them good for doing readings. Sure, this isn't a traditional deck, but that doesn't bother me - I've got plenty of those in my collection when I want a traditional reading. This is for when I want to be cheered up, entertained and also get great insights into the way my life is unfolding. The deck is good quality, comes in a sturdy box with a booklet and also has a very reasonable recommended price. It would make a nice Yule gift for anyone who collects tarot decks or loves animals. You can view The Animal Tarot on Amazon.